We are off to Mukilteo to celebrate the establishment of Snohomish County by the Legislative Assembly of the Territory of Washington on January 14, 1861. The assembly assigned Mukilteo as the interim county seat until an election could be held, probably because the settlement had four buildings to Snohomish’s one. This month’s rare historic image came into the possession of the Snohomish Historical Society already framed with a handwritten label reading, “Mukilteo, 1862.” On the reverse it read, “The County Seat of Snohomish County,” along with William Whitfield’s name. 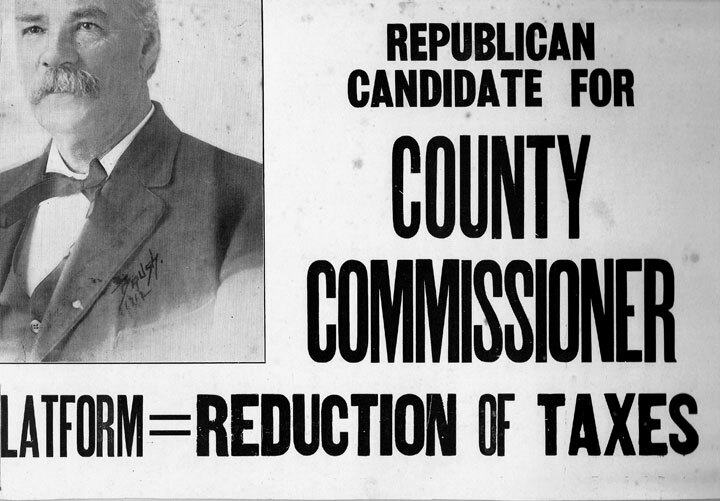 The process of liberating the fragile print from its non-archival surroundings revealed a backing piece cut from a Whitfield political campaign poster. It was most likely recycled following Whitfield serving for one term in the 1870s. We assume the framed image once hung in his Snohomish office or home. When Jacob Fowler moved his hotel from Ebey’s Landing he adopted the Indian place name Mukilteo considered to translate as “a good camping ground.” But it was Morris H. Frost, the customs collector at Port Townsend, who first acted on the business potential of the site by staking a claim on the beach in 1860, then inviting Fowler to join him. It was a popular location for the first peoples well into the historic period, including the signing of the Point Elliot treaty in 1855. For Frost and Fowler, it held promise as a handy stop on the water route between Seattle and Bellingham Bay. At the second meeting in May, Ferguson and Cady were issued a licensed to maintain a ferry across the Snohomish River, but with only 49 white people counted as living in the new county, we wonder if it ever became operational. A final piece of business was to divide the county into two precincts for the election in July. One at the Frost & Fowler store, and the second to be held at the home of E. C. Ferguson – Snohomish’s only building. 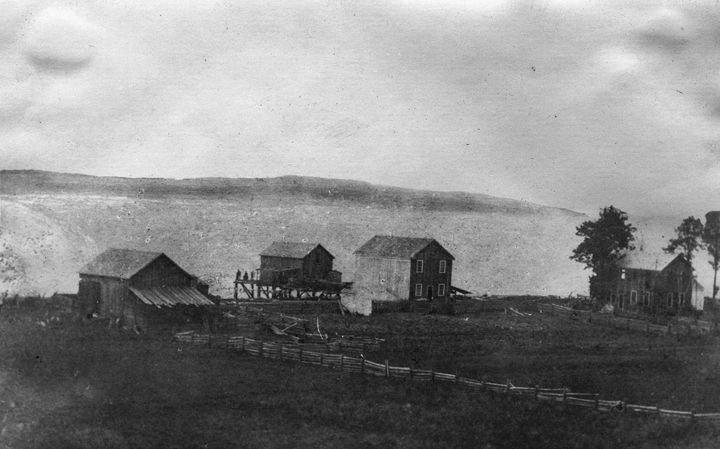 Mukilteo, 1862. 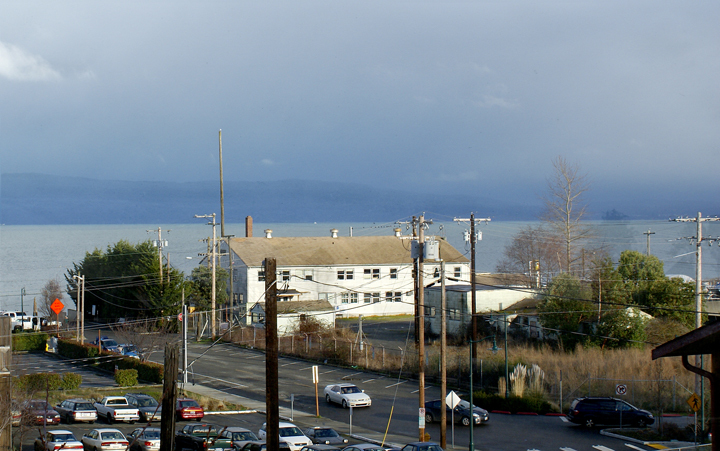 Compared to Snohomish in 1862, Mukilteo was an “urban center” with the four buildings pictured here. One of the buildings was the Frost and Fowler store and another the post office. Mukilteo was designated as the interim county seat for the new Snohomish County until an election was held in July 1861. Mukilteo Today. Replacing the buildings of the original town site is the Mukilteo Research Station, one of several carrying out the work of the Northwest Fisheries Science Center. Just south of the Station is the Washington State Ferry operation, replacing the 1860s use of dugout canoes. More reading: A Thumbnail History of Mukilteo; and thanks to David Dilgard for his help locating the contemporary point of view for the repeat photograph. Published January 19, 2011 in the Snohomish County Tribune. This entry was posted in Posts and tagged Mukilteo, Snohomish WA history on January 12, 2011 by warner.